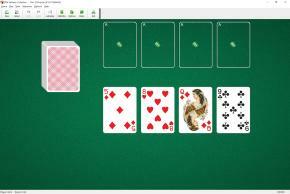 Tam O'Shanter Solitaire uses one deck (52 cards). You have 4 foundations and 4 tableau piles with one card in each pile. Only the top card of each tableau pile is available for play on the foundations. You cannot move cards from one tableau pile to another. When you have made all the moves initially available, click on the stock pile to deal one card on each tableau pile.